Any real life fuel economy estimates, please? We have a 2015 Terrain SLT with AWD and 2.4l now with 40,000+ miles. When I drive the speed limit on the highway I see 30+ mpg and rising on the last 25 miles of fuel economy. When my wife drives it in mixed and allot of parked and texting time, she see 21 mpg. I traded my 2010 LTZ Nox for a 2016 LTZ because I knew that the next generation would be smaller as a part of Chevy's policy of give them less for more. I value the extra room of the 2010-2017 NOX, and the sliding rear seats. I get at least thirty mpg hiway, and mid twenties in suburban type driving, and I consider that pretty good for the performance and room. I suspect the new generation with the smaller turbo will come in at about the same numbers. To get any performance out of that smaller motor, yoou will need to wring it out like you have to do with the Cruze, etc. In the real world, that will negate much of the advantage the smaller turbo. When the 2.0 Turbo appears, you will get more performance and pretty good mileage. I had that unit in a Caddy ATS, and I got 30/23. That said, was a rough, noisy and oil burning unit that I will never own again - in anything. The good news is that there are a lot of 2017s on the lot, and they are going at blow-out prices. I have a 2014 Equinox LT with 2.4L 4 cylinder/6 speed automatic. I log every tank of fuel I buy. Since 12/26/13 my accumulated average mpg is 28.84. The tank with the lowest mpg was 23.53 and the highest was 33.42. I live in southeast Oklahoma and I have a daughter in Andover, Kansas. My lowest mileage is usually at turnpike speeds or 75-80 mph and those trips involve a lot wind. Headwinds or tailwinds will definitely affect your mileage especially at those speeds. My best mileage trips are from my house to Texarkana, TX where much of the way it is in Akansas rural highways with 55 mph speed limits. 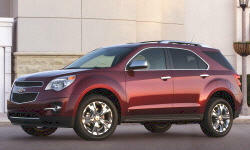 The new Equinox have an option for a 2.0L turbo. I had this engine in a 2008 HHR SS with 5-speed manual transmission and enjoyed it very much. It has really good power and in that vehicle I got similar mileage to what I get now with my Equinox. However it was about 600 lbs. lighter and somewhat smaller frontal area. With the turbo you can get very good mileage if you drive in a restrained manner, but you have the option of more power if you need to call on it. I bought a 2017 Equinox LT1 with AWD on 3/27/17. Really didn't want AWD but that's what they had with the safety features I needed and the price was right. Only drive about 6,000 miles a year so mpg not really an issue. I don't really have a number yet as my son put an unknown quantity of gas in it for me. I am expecting low 20's as my driving trends toward city v.s. highway. We can't buy 100% gasoline in Ohio (or most anywhere else) and the EPA numbser are based on that. The 90/10 gas/ethanol blend will get about 3.5% less mpg. That's our govt. for you - have mpg number based on fuel you can't buy due to their gasahol mandates. MPG aside, we test drove the Hona CRV, Toyota RAV4 and the Eqiniox and preferred the Equinox for comfort and ride. (2 wheel drive CRV's were in short supply as well.) But as I stated above, mpg was not a major issue for us. The 2017 Equinox is a tad bigger than the CRV and RAV4, The 2018 Equinox has been downsized a bit. With the lease ending on our 2015 Terrain (same as the Chevy Equinox except for exterior sheet metal) and no really good lease deals on Buick Envision 2.0T we ended up purchasing it. It is a little smaller than the Terrain over all but is quicker, more agile, smooth riding/super quiet, and more fuel efficient on the highway. The added feature of stop/start help along stop lights in saving fuel and is pretty much unoticed. We haven't had a chance to go through a whole tank but with just 15 miles of highway driving takes our city average of 23-24 mpg to 28 on the last 50 mile average readout. At highway speeds this might top out in the mid-30's for longer drives and once we get some more break-in miles. This turbo-4 has V6 torque but without the penalty. I'm sure the 2018 Terrain/Equinox with the 2.0T will be just as good or better in fuel economy than the model it replaces and continue with a smooth ride and a quiet one with Active Noise cancelation.